Do you know your David Guetta’s from your Seth Troxler’s, your Gigi D’Agostinos from your Nina Kraviz’? If you don’t, do not fret, because this is only an online slot game, and no DJ knowledge is necessary. All you need to do is sit back, relax and deposit some of your sweet cash into DJ Wild and spin through this electric gameboard that features an arena-backed soundtrack, strobe lights and realistic graphics. Looking for more visually enticing games? Click to view UK slots now! Swedish developer ELK Studios have a long history with online gaming experiences. After bursting onto the scene with the online slot Hong Kong Tower in April of 2013, ELK Studios continues to make new ground in betting entertainment every day, always coming up with fresh new ideas and the confidence to try something a little different with each new game, play online slot games on the internet now! Avicii? Flume? Calvin Harris? Deadmau5? Never heard of them but have you heard of Elk Studios highly addictive 5 reel by 20 pay-line online slots DJ Wild? It’s pretty cool. There is a grand jackpot just waiting to be played in the form of 170,000 coins! the first thing you are going to notice with this game is the music. It feels like a club hit and that's because it is, and it’s going to help you win some really big pay-outs (there is also a mute button if it isn't your jam). We have prepared a list of online games for you to read more about the best games. This slot is very unique in the fact that it chooses to not really leave much space between the symbols and the outside of the display. You don't really see online slots do this kind of thing as a much wider picture can allow for a less cluttered look. But for some reason, DJ Wild’s look is very unique and plays to the wild that exists in half of its name. The music mixed with the appearance of this slot makes it very appealing for those who want to pretend like they are a rich DJ (or you can play this game and become your very own rich DJ, just saying). 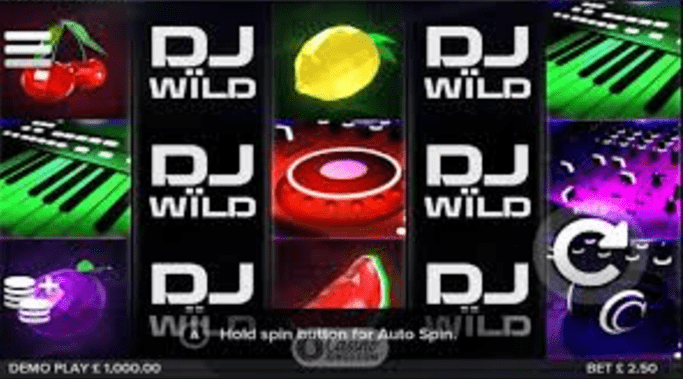 Symbols in DJ Wild are very centred to the theme of the overall game: headphones, decks and synthesizers are just a few examples of the symbols that you can find in-game. Synthesizers will be getting you the highest score with 500 coins for a stack of 3, 800 for 4 and 1,000 max at 5. Following that is the mixing desk which will bag you 200 for stacks of 3, 300 for stacks of 4 and 500 for 5. On the board, you also have a mix of fruits that will give you a smaller result but a result nonetheless. Cherries, melons and plums can be found on the reels and will get you anywhere from 20-80 coins depending on how many symbols are matched in repeat succession. Wilds in DJ Wild have the ability to substitute other symbols for a possible different opportunity at matches across the board. Wilds will also trigger re-spins! Which can then be re-triggered with each additional wild revealed, so it really benefits you to look out for those wilds.